A Massachusetts ballot initiative on nurse staffing ratios would cost hundreds of millions of dollars a year, according to an estimate issued Wednesday by a state panel. 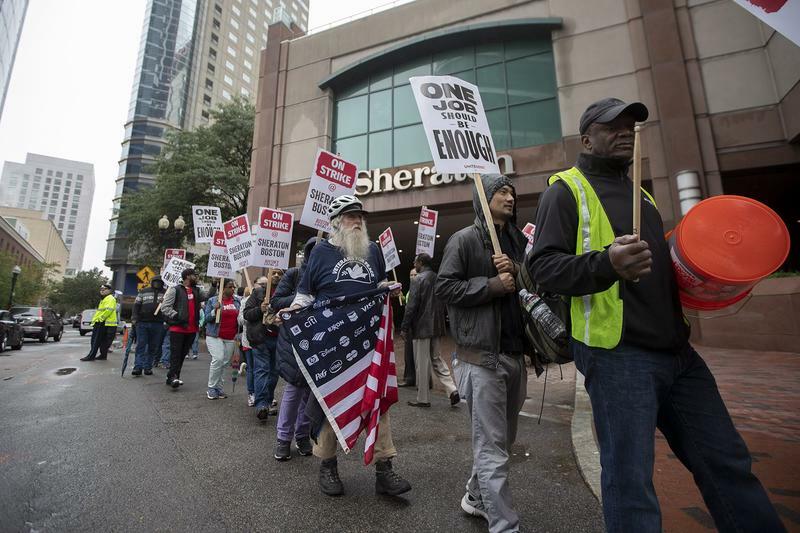 More than 1,500 workers at seven Marriott International hotels in Boston went on strike Wednesday, after months of unsuccessful contract negotiations. The workers include housekeepers, doormen, cooks and dishwashers who say they want better wages and benefits so they can afford to live in the city. They took their grievances to the street early Wednesday morning, walking out of the Ritz Carlton, the Sheraton Boston, the W Hotel Boston, Aloft Boston Seaport District, the Element Boston Seaport District, the Westin Boston Waterfront and the Westin Copley Place. The hopes and dreams of the labor movement have long been expressed in song. Unions are less powerful than they once were. But in the Berkshires, a group of young activists are working to keep one labor movement song alive.